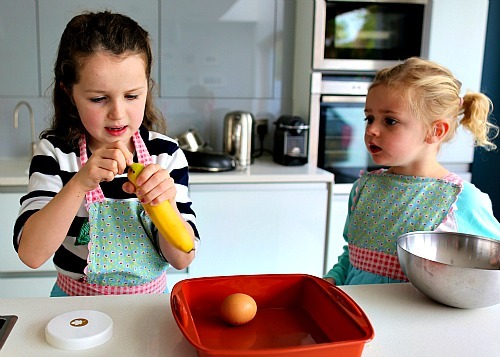 Siobhan Berry, owner of www.mummycooks.ie shares her advice on cooking with kids. My first memory of cooking with my children was placing their highchair within a short distance of where I was, talking them through what I was doing and allowing them to taste at various stages. I now have two girls that love to help me prepare dinner and on occasion do some baking! When you think of a picky or fussy eater we understand that the child is just afraid, sometimes terrified of new foods or even foods that they once ate. A great way to overcome this fear is to help prepare the meal in the kitchen. By touching and feeling different vegetables the child will become desensitized and is then more likely to try new things. Cooking gives a child respect for food and the provider. A meal does not just appear on the table. It takes time to prepare a meal, if they understand this they will be much more likely to want to try it and finish it. Cooking requires maths skills so instead of Mum working out the measurements, halving or multiplying recipes, get the little ones involved for some added learning in the kitchen! It doesn’t have to stop there either as you will more than likely find yourself explaining how things are grown or made. Helping in the kitchen will also build their confidence, they will be so proud when the whole family sits down to enjoy something they have either prepared all by themselves or had a part in making. It is also important to note that all of your efforts can be ruined by giving a child too many snacks or the wrong snacks throughout the day. It is recommended that you give your child at least a 3 hour gap between a snack and dinner. 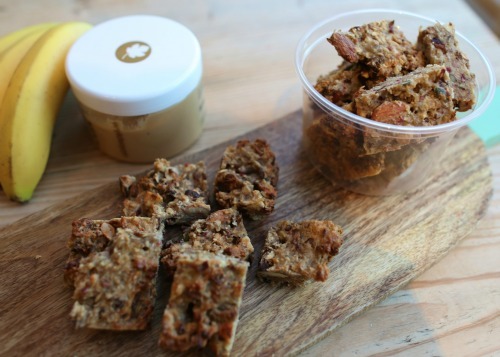 Some snacks are very high in sugar and so your child might not last the 3 hour between meals. Nuts and seeds are a great snack and will really help your hungry child last the 3 hours to dinner time. 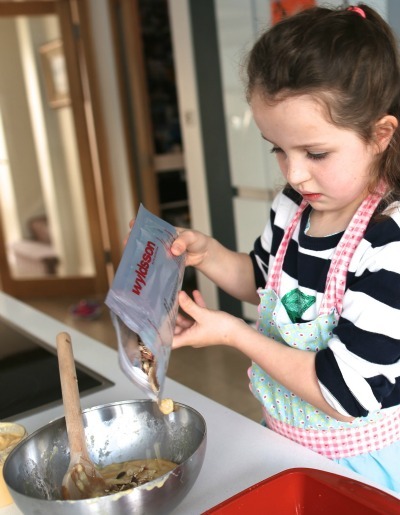 My kids loved preparing the Bake at Home bar mix kit from Wyldsson, it was a great afterschool treat for the week! The best thing about it was the simple to follow instructions, which meant my 7 year old was able to take charge and complete all of the steps and explain to my 4 year old what she needed to do. They were ready in no time and the girls were so proud of their culinary triumph! You may be afraid that involving your kids in the kitchen will mean more mess and more time. That may well be the case, at least in the beginning so start small. Choose one meal per week for them to get involved in. Make sure that you give them doable and age-appropriate tasks. Over time, you will find your rhythm together and your child will become a great help in the kitchen. It is also a great way to spend some quality time with them during the busy work week. For family friendly recipes and more information about how to feed your family healthy, home cooked meals visit www.mummycooks.ie. « So what should I snack on?